Of the 50 varieties of poppy in the world, the most significant to New Zealand and Australia is the red poppy (Papaver rhoeas). It is the poppy most wear pinned to their coats when acknowledging the past and present soldiers of our countries. 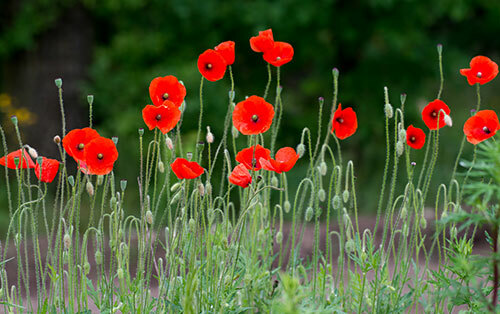 Among a host of common names, ‘corn poppy’ no doubt refers to this plant’s intrinsic part of the corn fields of Europe. Since the earliest settlements started cultivating the land and planting annual grain crops, this poppy has been known to grow among the ripening grain fields. They’re tolerated by farmer as poppies do not hinder the collection of the crop, as the flowers mature and drop their seeds before the grain is ready for harvest. The bright red display has been captured over the centuries by artists. Some seasons, when conditions best suited the poppies’ preferment, they would cover the landscape. Most years though they would flower sporadically and perhaps grow along pathways and only on the cultivated field perimeters. With trench warfare of World War One, the landscape was considerably compromised as it changed from peaceful grain-producing fields to churned-up soil. 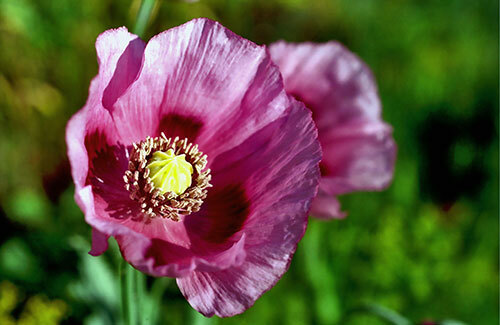 The disturbance caused the emergence of previously dormant poppy seeds to germinate in the early summer of 1915. This was noticeable on the battlefields of Belgium, France and Gallipoli. In the battlefield, between the warring factions, bright red masses of poppies bloomed. The year of 1915 was one in which the weather proved favourable for a prolific showing of the field poppy. 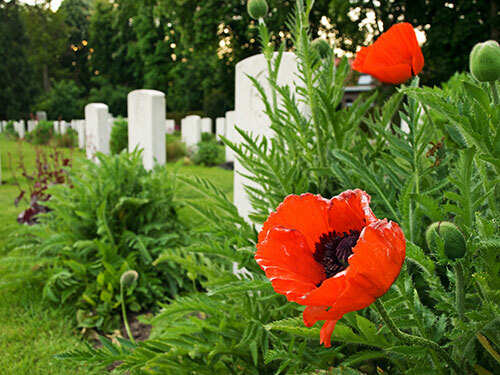 The symbolism of the red poppy was then immortalised in Lieutenant Colonel John McCrae’s poem In Flanders Fields. He had been saddened by the death of a friend and fellow Canadian soldier and wrote him this poem. Flanders poppies are instantly recognisable. In Flanders fields the poppies blow Between the crosses, row on row, That mark our place and in the sky The larks, still bravely singing, fly Scarce heard amid the guns below. We are the Dead. Short days ago We lived, felt dawn, saw sunset glow, Loved, and were loved, and now we lie In Flanders fields. Take up our quarrel with the foe: To you from failing hands we throw The torch, be yours to hold it high. If ye break faith with us who die We shall not sleep, though poppies grow In Flanders fields. Ypres Reservoir Cemetery in West Flanders, Belgium. In 1918, the Overseas War Secretaries met at YMCA headquarters in New York. On volunteer duty was Moina Michael. She picked up a magazine in which was published In Flanders Fields and was so influenced she went out and bought 24 red poppies. Moina had already made flower arrangements for the conference, but wanted to add these red poppies to the display. She showed conference delegates the poem and explained why she had added the red poppies. These delegates, suitably impressed, took the poem into the conference with them and told the story of Moina purchasing the red poppies as a symbol. From then on Moina took up a campaign and in 1920, the American Legion accepted the red poppy as a National Memorial Symbol. Also attending that conference in New York as the French delegate was Madame Anna Guerin. She took the idea of the red poppy being a memorial flower back to France. By 1921, she had spearheaded the production of red silk poppies that could be pinned on the wearer for memorial occasions. These created a French-based industry that employed both women and children in the flower production and the French-made poppies were being sold in America. During that same year, Anna visited or sent representatives to Australia, Canada, Britain and New Zealand. 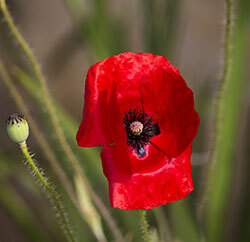 As a result, Canada adopted the red poppy as the official flower of Remembrance. The British Legion launched the annual Poppy Day Appeal. Armistice Day Remembrance in Australia was inaugurated the same year and in 1922, the New Zealand Returned Servicemen Association (NZRSA) had imported from France a consignment of silk red poppies for April 25. The next year in New Zealand saw production of the poppies here as a fund-raising appeal. The tradition of the poppies being sold the Friday before April 25 had begun. Field Poppies can reach heights above 60cm. The Shirley poppy Shirley poppies are the offspring of the red field poppy. They were hybridised in England in the 19th century. These garden annuals are just as popular today and, like the Flanders red poppy, will readily self-seed and make a colourful display of varying shades of pink, white and red flowers.